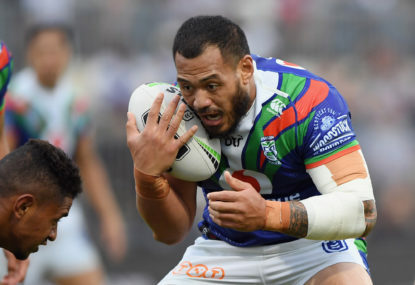 With the off-season from hell long vaulted, it was business as usual, and for my good mate Anthony that meant reading a barrage of my hyperbolic pro-NRL texts. Only this year there was a wicked twist. Rather than basking in a bevy of comic-laden retorts, I was promptly axed and left wheezing for a medicab thanks to this parting shot: “Not me. I’m on the bus to November, see you then”. Now just so you know, Anthony’s no token footy fan, so this was far deeper than a bad-hair-day sook. Long before the likes of Danny Buderus, Boyd Cordner and Latrell Mitchell, Taree had my mate, Anthony. And while he never claims to have delivered on the park, he’s rusted on tighter than a grandfather’s FJ wheel nut. A Super League survivor who still clung tight even after the NRL speared his beloved Bears, Anthony’s tougher to remove than a month-old beetroot stain. Not even bigwigs Ken Arthurson and John Quayle could shake him from a top-end bash back in the day, welcoming him with open arms after falling for his fake allegiance to the NSW Touch Association. So when Todd Greenberg is chasing free advice, his team could do far worse than listen to this fed up and battle-scarred supporter who doubles-up Monday to Friday in Sydney’s corporate space. Thankfully, in the interest of therapeutic recovery, Anthony agreed to pour his heart out and let the demons loose while the camera rolled. In a wideranging chat, Anthony opened up some of the NRL’s most divisive topics. After simmering to the beat of the NRL’s horror off-season, he took aim at the conflicted approach of the NRL and its clubs. 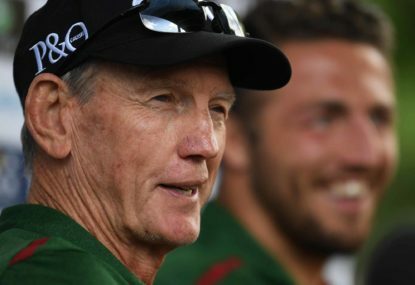 He pointed the finger at Cowboys chairman Laurence Lancini’s negative response to the NRL after their decision to stand down a guilty Scott Bolton and was surprised by Manly and St George Illawarra’s attempts to play Dylan Walker and Jack de Belin. “While I see the point they are trying to make, I’m absolutely staggered at the naivety that they are displaying in the current social climate that it’s a good idea to push back,” he said. 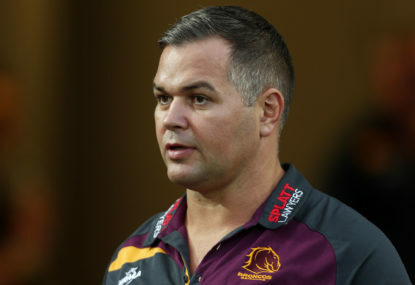 On the Indigenous All Stars’ attempts to promote discussion on alternatives to Advance Australia Fair, Anthony felt the NRL failed to capitalise on a golden opportunity to embrace the team’s mature approach, saying, “Whenever this happens, I feel the game misses the opportunity to promote the discussion in a way that the conversation continues constructively and respectfully”. And on grassroots development, he didn’t have to think too hard before explaining why AFL participation rates have increased faster than the NRLs. “The AFL are knocking the NRL out of the park with what they are doing in the junior space. 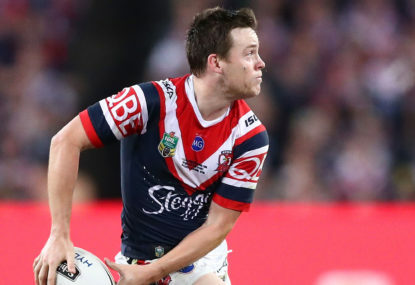 This is the third or fourth of these (Sherrin) balls we’ve got from the AFL, and here we are in the middle of Sharks and Dragons territory and rugby league hasn’t come near the schools in this area,” he said. But at the end of the day, his biggest gripe is with the game’s leadership and its inability to define and navigate towards a desired outcome. “There’s been so many mixed messages over the years surrounding what the game actually wants to do. 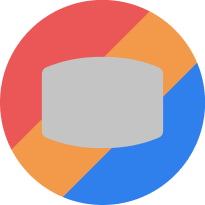 If you look at other industries, they know what they want to do, and they know where to do it. The good industry players are the absolute best they can possibly be within those confines”. Tough topics, strong words. Where do you stand, Roarers, is the Taree junior on the right bus? 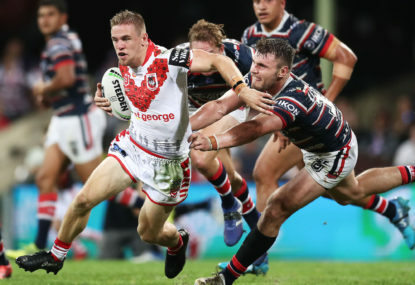 We are a quarter into the 2019 NRL season and as always there have been a number of surprises and disappointments. 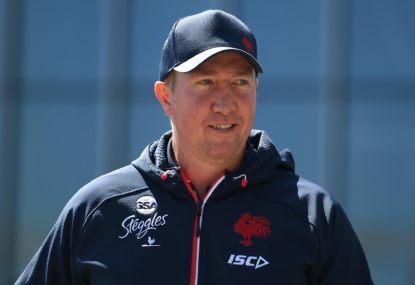 Sydney Roosters coach Trent Robinson denies his Tricolours are the form side of the NRL in 2019.